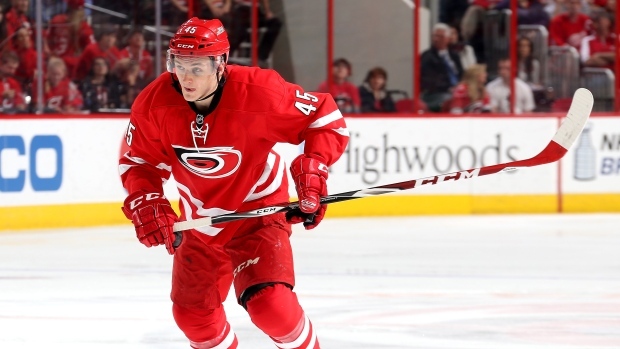 MONTREAL — The Montreal Canadiens have acquired Keegan Lowe from the Carolina Hurricanes for Philip Samuelsson in a swap of minor-league defencemen. Lowe, who was born in Greenwich, Conn., and grew up in Edmonton, has played 49 games for the American Hockey League's Charlotte Checkers this season, putting up three goals, nine assists and 53 penalty minutes. The Canadiens say he will report to the AHL's St. John's IceCaps. Lowe played two NHL games with the Hurricanes in 2014-15. He was selected by Carolina in the third round, 73rd overall, of the 2011 NHL draft. Samuelsson, a native of Leksand, Sweden, had a goal, four assists and 21 penalty minutes in 40 games with the IceCaps this season. He has played 13 career NHL games with Pittsburgh and Arizona after being drafted in the second round, 61st overall, by the Penguins in 2009. Lowe is the son of Hall of Fame defenceman Kevin Lowe, while Samuelsson's father is former NHL defenceman and current Checkers coach Ulf Samuelsson. BTW. Philip Samuelsson will now play for his dad, Ulf, who is head coach of the AHL's Charlotte Checkers.